From the average age of accounts receivable (AR) to your cash collections as a percentage of net revenue, you know that keeping tabs on these areas of your billing processes is the key to remaining profitable. So, what’s next? Answer: The work. Your revenue cycle KPIs are only as good as the data you collect to determine them. With inadequate or confusing information, your center could make decisions based on misleading statistics. But you can effectively track KPIs by making sure your stats follow the four "Cs." In order to truly benefit from KPIs, you want the data behind them to be clear-cut – easily understood and calculated. A KPI like "percent of AR greater than 90 days," for instance, is straightforward and involves collecting basic, easily computed data. As a revenue cycle management rule of thumb, you don’t want KPI calculations to create additional questions. They should be easy to explain and leave no question about how or why you’re arriving at a particular decision. There’s a reason why so many organizations have trouble successfully managing their revenue cycle: it requires time and commitment. Data for tracking KPIs needs to be collected and analyzed on a regular basis. Once a month is a good target; weekly or even daily is ideal. If you are only looking at your revenue cycle performance once a year (as many facilities do), you may have difficulty identifying and understanding trends in the numbers, or you may discover an issue after it’s already escalated and resulted in unrecoverable revenue. If data is analyzed routinely, potential problems can be discovered – and corrected – early. It may seem obvious, but when assessing your revenue cycle health, make certain you are measuring those processes that actually affect it. If what’s being measured is not significant to the cash flow of your business, then it may not be necessary to track. There is essentially no limit to the amount of data that can be collected and measured, so it is important to identify the metrics that matter most to your revenue cycle goals. 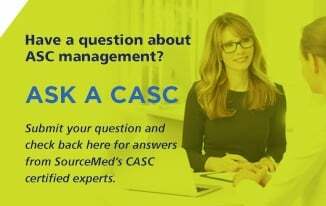 It typically takes an integrated approach to improve revenue cycle processes – and that applies to both operations and the individuals in the revenue cycle chain. Stakeholders across the organization must believe in your KPI-centric plan, agree on how calculations are made, and buy into the process. Everyone on the revenue cycle team must understand how their particular role in the process ladders up to the overall goal – improving revenue cycle results. It truly is a team effort. KPIs neatly organize the information you need to highlight both the strengths and the weaknesses of your revenue cycle management process, but if you’re not tracking them effectively, you could be left in the dark. If you’re ready to delve into the world of data and analytics, then just remember to follow through with the above Four Cs. You can do it. You just have to get started. 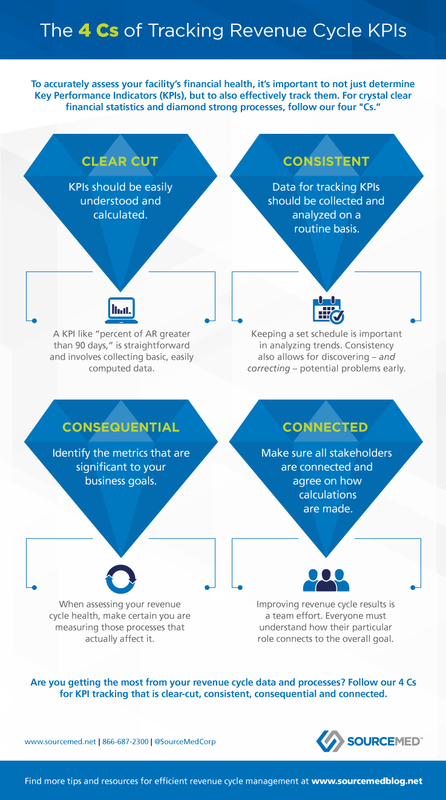 How do you determine and track your revenue cycle KPIs?